For the chef who can never have enough space, an outdoor kitchen is just the ticket. If there’s one word to describe the potential of outdoor kitchens, it’s spacious. Taking the kitchen outside gives you the chance to design your dream kitchen, one that’s free of the constraints of indoor space. Your outdoor kitchen design is limited only by your imagination, which is why they’ve become very popular projects among homeowners in recent years. Of course, with so many options for design, it can also be a little overwhelming to get started on an outdoor kitchen project. Home improvement contractors with experience building outdoor kitchens can help you flesh out and solidify your ideas, but here are a few basic tenets that you should keep in mind for an outdoor kitchen. Outdoor kitchens almost always include a large built-in grill, which generates a lot of heat. These are best placed up against a wall, which serves as a barrier that keeps the heat away from the rest of the kitchen. Outdoor kitchens don’t necessarily need roofs, but roofs do offer more protection from the elements, which keeps your cooking equipment safe, and allows the party to go on even if it starts to rain. Your seating arrangements will depend on how you plan to use your outdoor kitchen. If you’re expecting to host company, you’ll want more seating. Seating also should be arranged to avoid any bottlenecks or difficulties in getting from one part of the kitchen to the other. 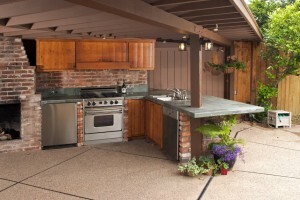 Check out some ideas for your outdoor kitchen at these links. This entry was posted on Thursday, March 20th, 2014	at 9:26 pm	. You can follow any responses to this entry through the RSS 2.0	feed. Both comments and pings are currently closed.